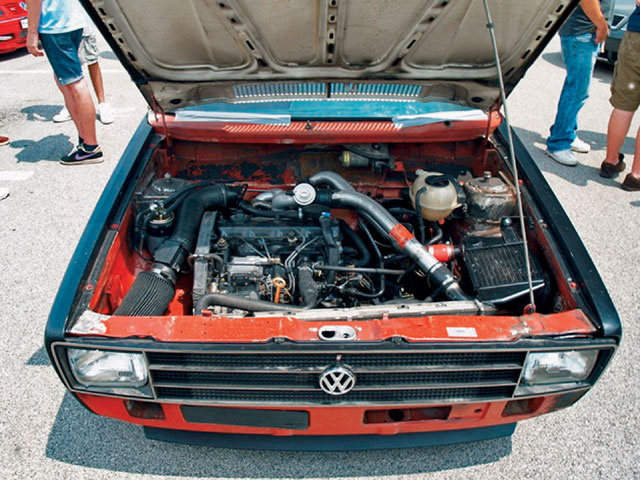 Totalcar Magazine - Tech - Sprucing up the TDI engine – match them well! 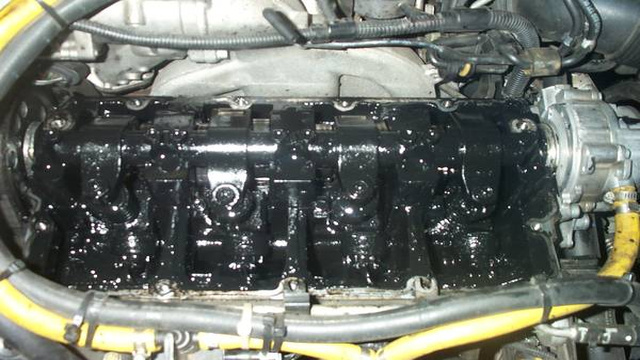 Sprucing up the TDI engine – match them well! Modifying the control electronics is just the first, and very basic, step towards getting more power from a diesel. This is what should come after. Diesel engines work with qualitative control. To put is more simply: to modify the performance of the engine you must vary the amount of fuel added to the air swept in through the intake, the amount of which is specific to the given rpm and remains unchanged. In petrol enginse the amount of air and the amount of fuel both change with load and rpm, in diesels, it doesn't. Previously this was done by distributor injectors (TDI) or Bosch type injectors, overseen by some electronic control. Then came unit injector systems (a.k.a. Pumpe Düse or PD) which were mechanical injector systems with high operating pressure. Nowadays we have common-rail (CR) systems. Various systems have various advantages. The first TDI engines were simple and easy to upgrade, part of which was no doubt due to the fact that they were highly overbuilt. PD systems were efficient and thrifty but also rather noisy, while CR systems are highly controllable. That also means their environmental impact (meaning both noise and gaseous emissions) could be well contained. This is of paramount importance as manufacturers are bound by environmental standards. In fact it was environmental regulations (along with high manufacturing costs) which drove pumpe-düse engines to extinction. 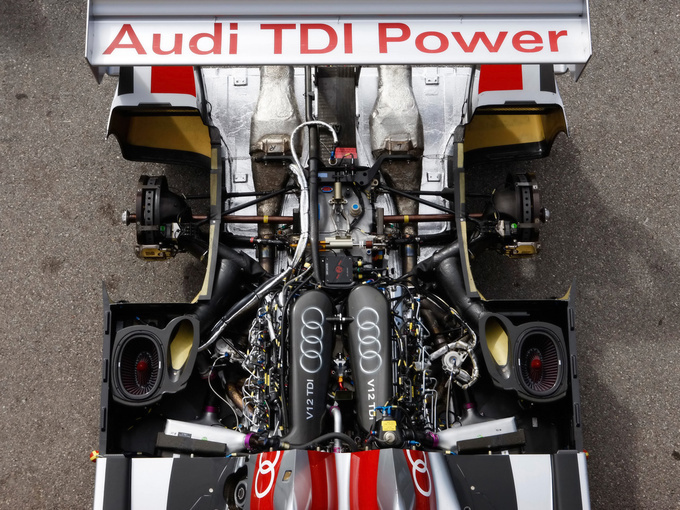 Early TDI systems had an operating pressure too low to achieve Euro4 emission standards, and it was impossible to make the unit injectors even more elaborate. The system was not suitable for more refined, multistage injection cycles, and the injection process is rather rudimentary compared to a common-rail system. With the electrically governed nozzles of a common-rail injector system multistage injection is really only a matter of writing the proper control software and it can be varied along multiple parameters. Wiping out electronic control from common-rail engines, like tuners did with early TDI injector engines, is downright impossible. Diesels are often criticised for their emissions. In earlier days they were almost considered superior to petrol engines but the discovery of carcinogenic nano particles put things in a different perspective. Regardless of diesel catalysts or even particulate filters these nanometre-sized particles escape into the atmosphere. Just how harmful they are, how they enter the blood stream and what can be done against them are still subjects of heated debates. We are not here to discuss the environmental impact of engines though. We consider our work successful if the souped-up engine confirms to the environmental standards it met before we started working on it. You cannot turn a Euro2 engine into a Euro4 one but if you go about your business with care, environmental parametres will not be significantly worse on the souped-up powerplant. You will see no cloud of soot coming out of the exhaust. Can a diesel engine, cranked up to 50% more power, comply with the emissions standards it used to adhere to in stock form? Actually it can but it takes a lot more than a software mod to achieve that. If you add the right amount of diesel oil to a specific amount of air you can contain emissions. However if you want to achieve higher engine peformance you need extra fuel, which means that, in order to uphold the emissions ratings, you also need extra air. There are certain things we can calculate but without field tests the whole thing is becoming eerily similar to a game of Russian roulette. Of course the tuning industry has some experience with old TDI engines... Stevie's engine could take 1.8 bars without an issue so it should pose no problem for you either. This is a tragically ridiculous approach to actual field testing. Fresh out of the factory, the engine is a highly complex system with components that are mutually matched to one another. The exact size of the turbo is defined by other parameters of the engine; the specific diameter of the nozzle is necessary for achieving an optimal spray pattern. Change that at any point and you will upset the inner balance of the system. Certain parameters are sure to change for the worse, while a few things may possibly improve. You must set the worsening parameters right by modifying the system at mulitple points. The first step in souping up the engine is to increase the amount of fuel injected into the combustion chambers. For electric systems (PD and CR) this can be done via electronic modding („chip tuning”), while for unit injector (TDI) systems you can apply chip tuning and modify the injector as well. Purely mechanical pump units have some advantages but you need proper training and proper diagnostic tools to modify them. A system with a 2.8 disk and a #10 pump unit is nearly identical to one with a 3.1 disc and a #9 unit, but the two will display different behaviour and may require injector nozzles of different diameter. All of this is properly sized in the factory, with due consideration to longevity, spray pattern and many other aspects. Ideallly a tuning specialist will also match them but I think we should be thankful if he has as much as decent experience with the system. Proper timing of the injection is fundamental to achieving the desired performance, engine sound and emissions. The angle of pilot injection, the sizing of the nozzle and the pump unit all belong together, these components and their settings must be harmonised. If you are talking about a PD system being upgraded via software modification, you still need to consider the size or the injector because you could upset the precisely calibrated dosage. Unit injector systems are very sensitive to quantities because the mechanically created operating pressure is powerful enough to strip the timing belt. You cannot increase the amount of fuel without an end, but there are other options such as installing a camshaft with a different profile which will build up injection pressure in a different way. Once you increase the injected amount and match all system components, you need to increase the amount of air supplied to the engine by the turbocharger. Turbochargers are simple machines. The kinetic energy of exhaust gases propels a turbine wheel which shares its shaft with a compressor wheel. The latter compresses the air in the intake mainfold which means more air per volume entering the combustion chamber. The degree of charge can be increased if the compressed gases (which heat up during compression) are cooled – this is what an intercooler does. Turbo manufacturers have a thick catalogue full of various turbochargers, each precisely calibrated to certain parameters, and engine manufacturers can pick whichever turbocharger suits their needs best. 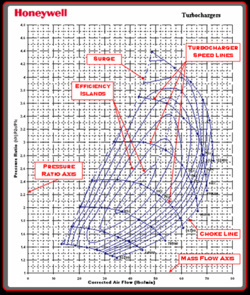 In analogy to photomodels who are rated by their breast, hip and waist sizes, turbochargers are classified by their charging efficiency as defined against their pressure conditions and air volume delivery. 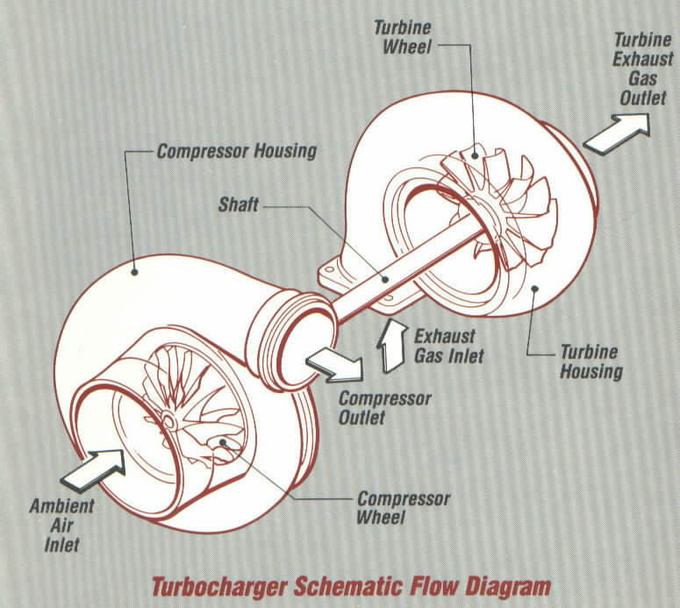 This diagram is slightly confusing for laymen but for engineers it is fundamental: this is what they use for matching turbochargers to engines. You cannot be a real tuner of turbocharged engines without knowing this diagram. 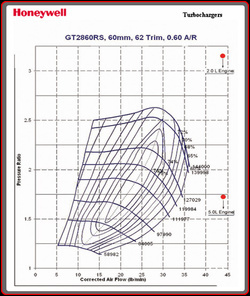 The narrow, central portion of the chart marks the highest efficiency range of the turbocharger. Ideally this is where you want to run your turbocharger, with the designated air volume and ratio. The more you rev your engine, the higher the turbocharger revs, and it will leave this ideal area. Its efficiency will decrease. That is exactly what happens when you electronically force an optimised turbocharger to deliver more air (provide higher pressure). Slightly increase the pressure and the gain will be especially obvious at lower engine speeds. However as rpm increases the turbo will be restricted because of the lower efficiency. Not to mention that higher load means higher mechanical strain causing damage to the compressor wheel, rocketing the vanes into the combustion chamber, possibly through the intercooler. The next step is inevitable: you need a larger intercooler. If you check the chart – and if you know the air volume and the planned rpm range of the engine – you will be able to find your ideal turbocharger that will provide optimal efficiency in the desired operative range. Like I said, the entire system is comprised of ideally sized and matched components; you can rarely make gains by modifying only a single component. 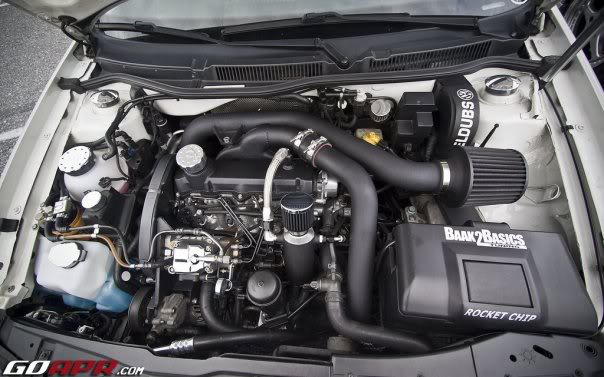 Larger turbocharger means more air, and even if charge ratios remain unchanged, the air charge will warm up more, thus you will need a larger intercooler. You need enough room to install the intercooler and you need to link it up to the system. Manufacturers can find various locations for that, ideally one where the intercooler does not block the airway to other coolers, or else they can size these coolers to ensure uninhibited operation. 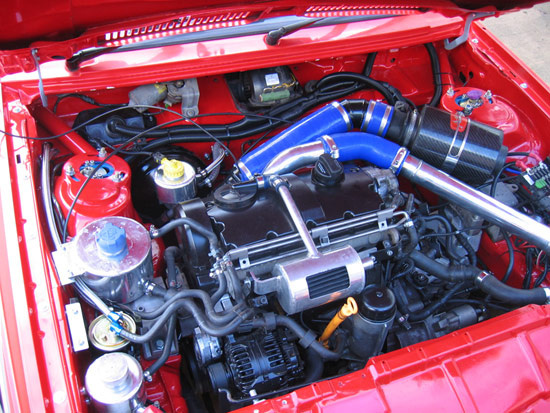 Engine tuners can also find good locations for an oversize intercooler, if all else fails they can cut out a piece of the bumper – the end justifies the means. Another consequence is an increased turbo lag. Also, the turbocharger is probably going to start delivering later. Since tt will be physically larger, it will have greater rotational inertia, and there will be a larger compressable air volume downstream of the compressor wheel, meaning pressure will build up slower. This is something we need to learn to live with. When you tune an engine it rarely gets a power gain throughout the entire rev range. Another thing to note: while soot is the only visible pollutant coming out of a diesel engine, carbon monoxide and nitrogen-oxides are also there to be accounted for. These are generated as a function of the quality and temperature of the combustion process. More powerful engines rarely have the same emissions values as their lower output (stock) versions. Think about well-known diesel tune-up wizards; they increase power by no more than 10-15 percent, yet, they keep all emissions within legal limits. What they really do is optimise, rather than tune, the engine. Soot is the mass of carbon particles left over after the combustion process in the combustion chamber. Soot is the end product of complex ttansformations and there are many factors at play. Even if the air ratio measured at full load is similar to the stock values we may be experiencing increased soot formation because factors, such as manifold pressure, will change, resulting in changes in swirl or flame front propagation within the combustion chamber. These all have an effect on soot formation, just like the quality and duration of injection. See the relationship between injected amount and injector port size. So at this point we have an optimally modified fuel delivery system, we have a harmonised turbocharger, with an optimally rated intercooler, and we have one fast car. In theory harmful emissions are more or less on par with a stock engine, there is no visible soot generation. There are only two issues left: how fast can the car go, and how long will it last? 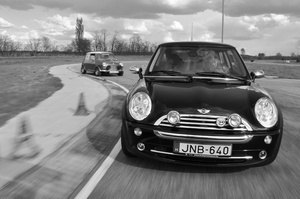 If the engine is tuned properly the car will be pretty fast, even with petrol turbo standards. 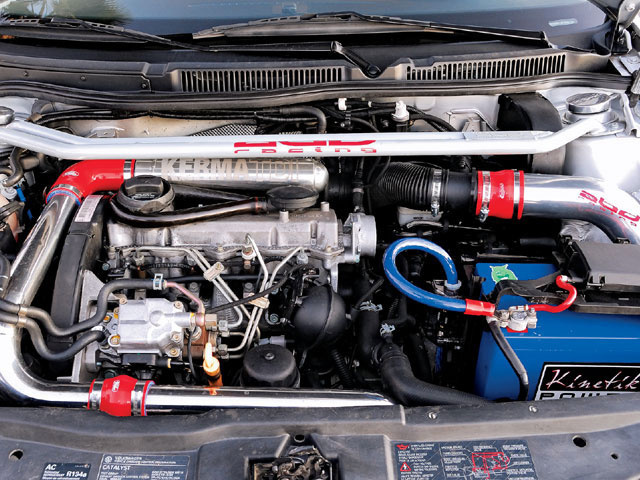 Well skilled turbodiesel wizards can manipulate engine characteristics in a way that mimics inferior petrol turbo engines – the powerplant will build up power from low down, rev into relatively high speeds, and provide even thrust. In their stock form these diesel engines operate in a very narrow power band which tends to favour the lower registers. That means they don't pack much punch. However I have personally experienced a four-cylinder prototype TDI which had no trouble revving up to 5000 rpm. For someone used to petrol engines this is still pretty low but with its substantial and even torque that engine carried the car like a feather in a windstorm. If you keep to calm crusing speeds the engine will need no more than 5 to 6 l/100km, but even at full throttle it is unlikely to consume over 10 litres. No petrol engine can ever do that – on the other hand a petrol turbo will easily outperform the diesel, especially if it's also souped up. And petrol engines may rev up to 8000 rpm. The other issue is longevity. Ancient four- or even five-cylinder TDI engines were constructed in a technologically inclined age which allowed for them to be substantially overbuilt. The amount of abuse these engines can take is nothing short of a miracle. 90 PS base versions are souped up to 150 PS without a problem and if you use them wisely they will run well over 100,000 kms. Well, you no longer have those around. Modern engines have adapted a different approach. Suppose there is a well constructed engine where neither the software nor the hardware upgrader has made serious mistakes. Because there are potential issues, such as the software guy mapping out fuel delivery in a way that there are substantial amounts injected at lower revs, assisted with some extra air from the turbo and the whole process results in sudden bursts of power which can easily overload the cranktrain up to the point where bearings call it quits. The slide bearings applied here need both oil pressure and sufficient rpm to receive appropriate lubrication. Take either of those away and the pin will fail to float on the oil film (it will 'sink'), causing dry friction which can ruin the engine in a matter of minutes. That is how you properly kill a cranktrain. It is also important that as you increase your maximum turbo pressure you should decrease your compression ratio in order to avoid excessive peak combustion pressure. Most engines can tolerate this mechanically rather well, because when there is high pressure there is also high rpm, meaning sufficient lubrication. However, thermally speaking things are not quite as bright. You can destroy valve timing control by insisting on the original servicing periods for the timing belt even though you are driving the pump unit off this very belt, or the unit injector components through the camshaft, resulting in excessive load on the belt. In this case the pump unit is working double time, while the unit injectors are injecting 50% more within a given time frame. That does increase system load. And yet your number one enemy is not mechanical but thermal load. 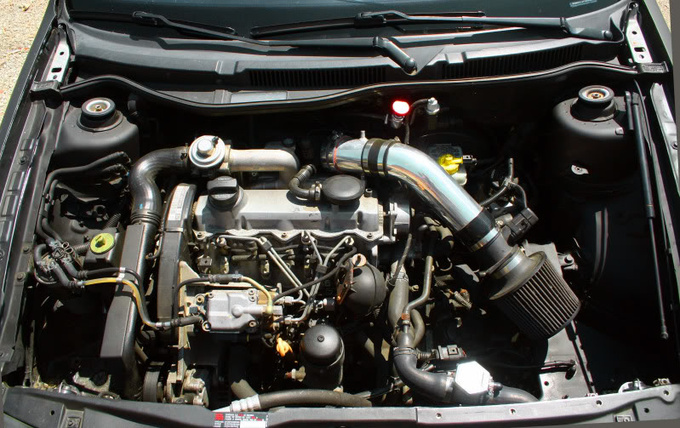 Diesel engines are particularly susceptible to that, since they operate by high-temperature compression ignition. As you increase turbo pressure and inject more fuel, you also increase thermal load. If you run the engine flat out, at maximum load, factory cooling will certainly not be sufficient, even though that was calibrated to keep the stock engine from frying even among excessive ambient temperatures, with the A/C running. But this is no stock engine, so if you start pushing it hard you can easily get your pistons melted and your cylinder head cracked, of course not before your radiator bursts and your engine oil fries. So how come TDI engines can be modded from 90 to 150 PS and still run several thousand kilometers? The answer is simple: those engines rarely run at their peak power and even then only for short periods of time, while extreme conditions that a manufacturer must account for (50°C ambient temperature, towing a caravan uphill etc) are avoided. As you decrease the output you exponentially decrease the thermal load exerted on the diesel engine because there is plenty of excess air in the fuel vaporising process. You amaze your friends with a quick dash at the street race, and then cruise at 50 kph, allowing the system to cool down – the engine oil doesn't even have time to heat up. Well built, finely tuned engines with components that have been optimally sized have to face loads no higher than the power output you are expecting of them. Thus, theoretically well built, souped-up diesel engines can be durable, powerful and good, without excessive emissions. Maybe it's just me who has never seen one like it.